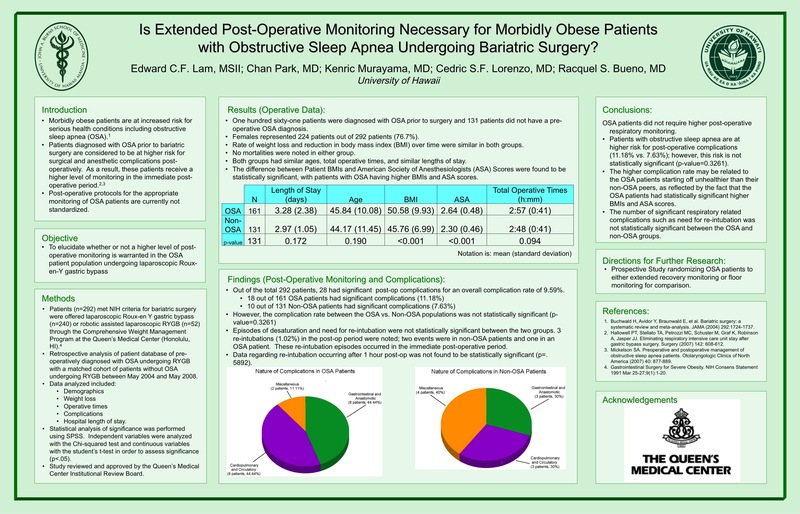 Is Extended Post-operative Monitoring Necessary for Morbidly Obese Patients with Obstructive Sleep Apnea Undergoing Bariatric Surgery? Objective: To elucidate whether or not a higher level of post-operative monitoring is warranted in the OSA patient population undergoing laparoscopic Roux-en-Y gastric bypass. Introduction: Morbidly obese patients are at increased risk for serious health conditions including obstructive sleep apnea (OSA). Patients diagnosed with OSA prior to bariatric surgery are considered to be at higher risk for surgical and anesthetic complications post-operatively. As a result, these patients receive a higher level of monitoring in the immediate post-operative period. Post-operative protocols for the appropriate monitoring of OSA patients are currently not standardized. This study attempts to elucidate whether or not a higher level of post-operative monitoring is warranted in the OSA patient population undergoing laparoscopic Roux-en-Y gastric bypass. Methods: Patients (n=292) meeting NIH criteria for bariatric surgery were offered laparoscopic Roux-en Y gastric bypass (RYGB) (n=240) or robotic assisted laparoscopic RYGB (n=52) through the Comprehensive Weight Management Program at the Queen’s Medical Center (Honolulu, HI). Retrospective analysis of a prospectively collected database compared outcomes and complication rates of patients pre-operatively diagnosed with OSA undergoing RYGB with a matched cohort of patients without OSA undergoing RYGB between May 2004 and May 2008. Outcomes data included weight loss, operative times, complications and hospital length of stay. Data was statistically analyzed using the Chi-squared test in order to assess significance (p<.05). Results: One hundred sixty-one patients were diagnosed with OSA prior to surgery and 131 patients did not have a pre-operative OSA diagnosis. Patients were between18 and 65 years old with a Body Mass Index (BMI) between 35 and 60 kg/m2. Females represented 224 patients (76.7%). Rate of weight loss and reduction in body mass index (BMI) over time were similar in both groups. No mortalities were noted in either group. The overall complication rate was 12.5%. Operative complications included post-operative anemia, marginal ulcer, anastomotic stricture, anastomotic leak, aspiration pneumonia, small bowel obstruction, and wound infection. The number of respiratory related complications such as episodes of desaturation and need for re-intubation was not statistically significant between the two groups. Only 3 re-intubations (1.02%) in the post-operative period were noted. Two of these events were in OSA patients. These re-intubation episodes occurred in the immediate post-operative period and were related to the need for muscle relaxant or narcotic reversal. Data regarding re-intubation occurring after 1 hour post-op was not found to be statistically significant (p=.8357). Conclusion: Patients with obstructive sleep apnea are at higher risk for post-operative complications. The number of significant respiratory related complications such as need for re-intubation, however, was not statistically significant between the two groups. OSA patients did not require higher post-operative respiratory monitoring.